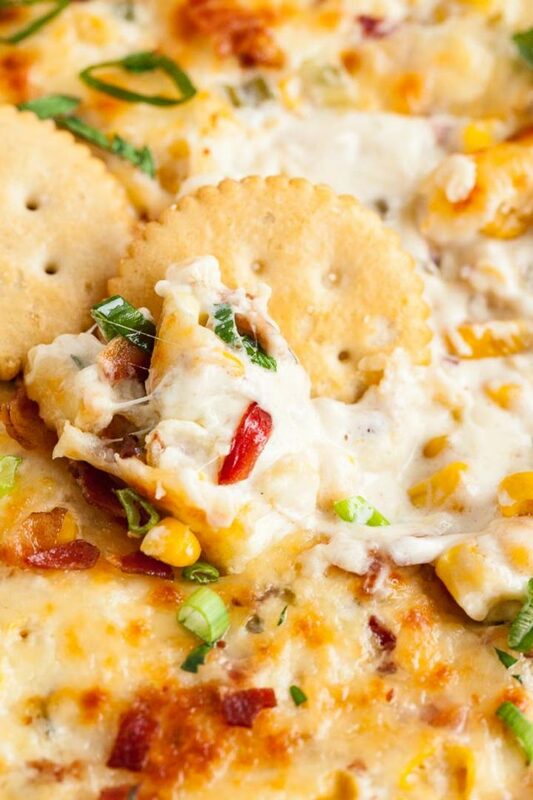 Hot Corn Dip made with cream cheese and mayo is loaded with bacon and three kinds of cheese. 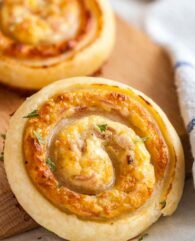 This cheesy, delicious appetizer recipe is sure to be a hit at any party and so easy and quick to throw together with pantry staples. This Hot Corn Dip with Cream Cheese and Bacon is perfect for your next Game Day, Cinco de Mayo, or any party! 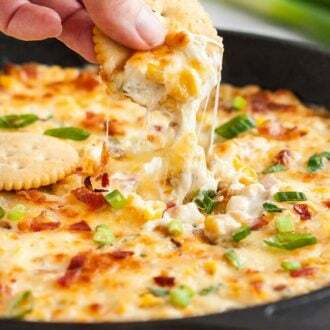 The warm and cheesy dip is super easy to make and tastes super delicious. You can assemble it ahead of time and bake it when you’re ready to serve it. It tastes best straight from the oven! I made this dip recipe for a party a few weeks ago and it was one of the first things that was gone. 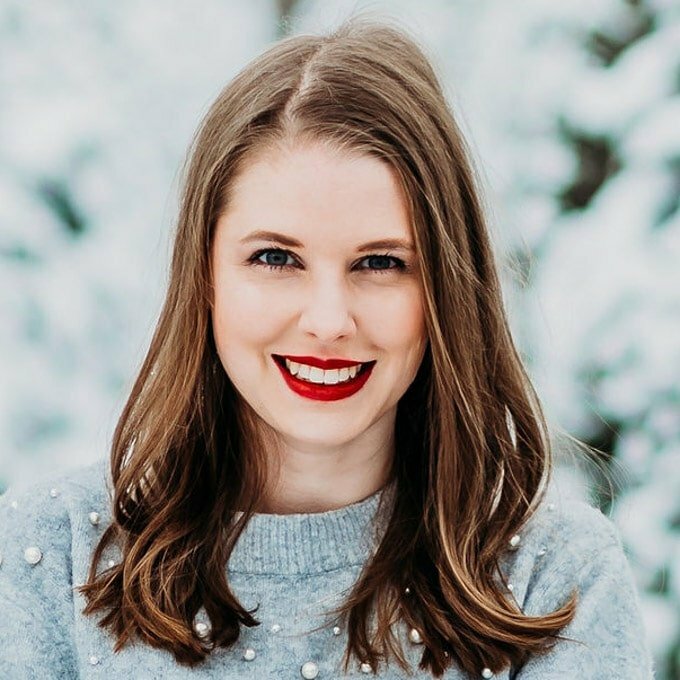 You could probably also make this hot dip in a slow cooker but I prefer to make it in the oven because it is faster and you get that melted bubbly, browned mozzarella cheese on top which is my favorite part. 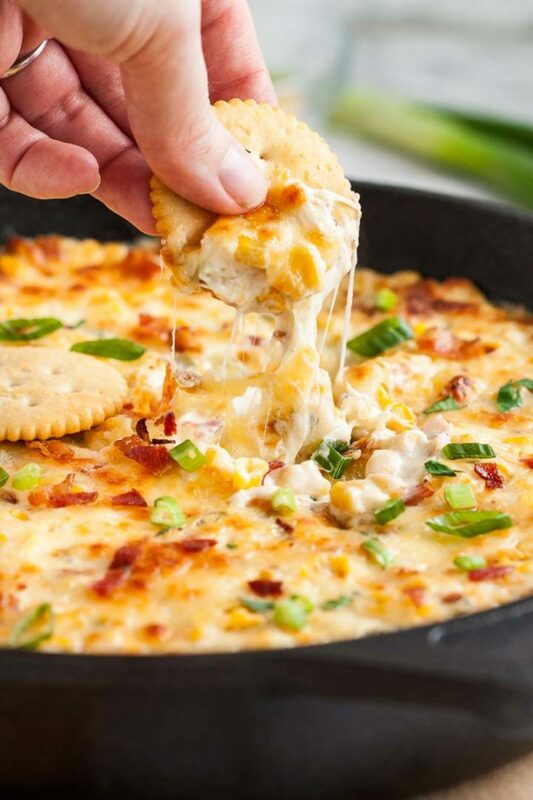 This hot dip recipe with cream cheese, corn, and bacon is highly addictive – you could call it Corn Crack Dip! I always find myself dipping everything into it, crackers, tortilla chips, bread, pretzels – this dip makes it hard to stop snacking. You have to try it! 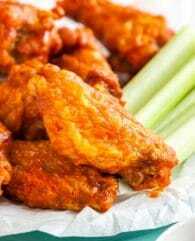 I use canned corn in this but you can also use canned Mexican corn, thawed frozen corn, or fresh grilled corn for this recipe. One 15-oz can of corn is equivalent to 1 and 3/4 cups drained corn, so you need about 3 1/2 cups frozen or fresh corn. Using one pickled jalapeno results in a dip that’s only a little bit spicy. Add more jalapenos if you like your dip really spicy! If you want you can saute the corn kettles until golden before adding them to the dip or use canned Fire-Roasted Corn (link below) but normal canned corn works just fine. 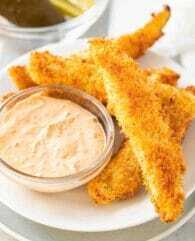 A great add-in for this dip recipe would be a small can of chopped green chilis! Instead of cheddar cheese, you can also use the same amount Swiss cheese, Pepper Jack cheese, or Monterey Jack cheese. This dip tastes best served hot! You can assemble it in advance, store it in the fridge until you’re ready to bake it or you can bake it in advance and reheat it for 10-15 minutes in the oven. The easiest way to cook a large amount of bacon that also makes less mess is to cook your bacon in the oven. You need 10 slices cooked bacon for this recipe so start with lining a large enough baking sheet with aluminum foil and lay the bacon in a single layer on it. Preheat the oven to 400° F and bake the bacon for 15 to 20 minutes flipping it halfway. Use tongs to transfer the cooked bacon to a plate lined with paper towels. Let any excess fat drip off and crumble bacon into small pieces (photo 1). Making this dip from scratch is super easy! 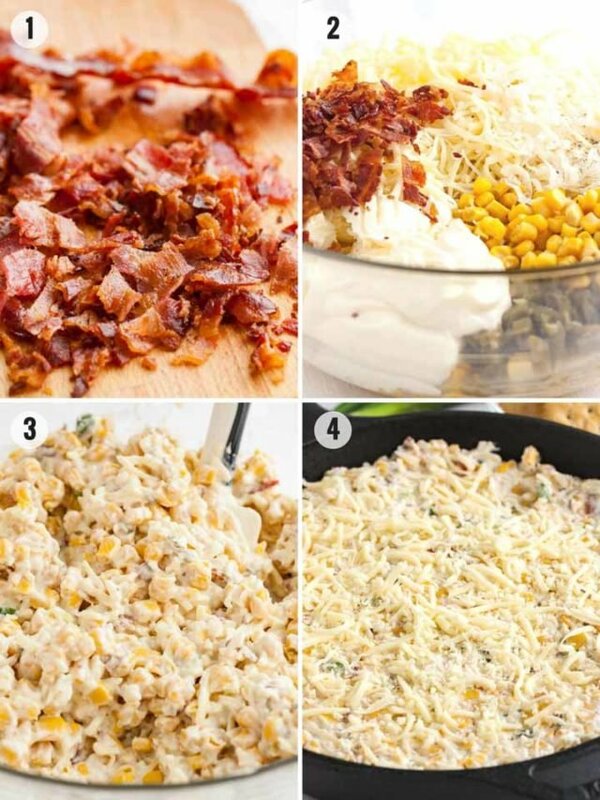 Combine all the ingredients in a large enough bowl (photo 2), mix with a spatula until everything is fully combined (photo 3), adjust seasoning and spiciness to taste, then transfer mixture to a cast iron skillet or baking dish and sprinkle remaining cheese on top (photo 4). Bake until bubbly and golden brown on top. I like to turn on the broiler for the last 1-2 minutes. Serve the dip with chips, tortilla chips, crackers, veggies, or anything else you like to dip. 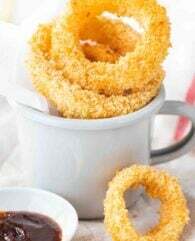 Looking for more party appetizer recipes? This skillet works best for this recipe. This one is super convenient, it comes with an attachable container for catching, measuring and storing grated foods. 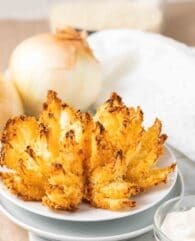 Great alternative to freshly roasted corn on the cob! 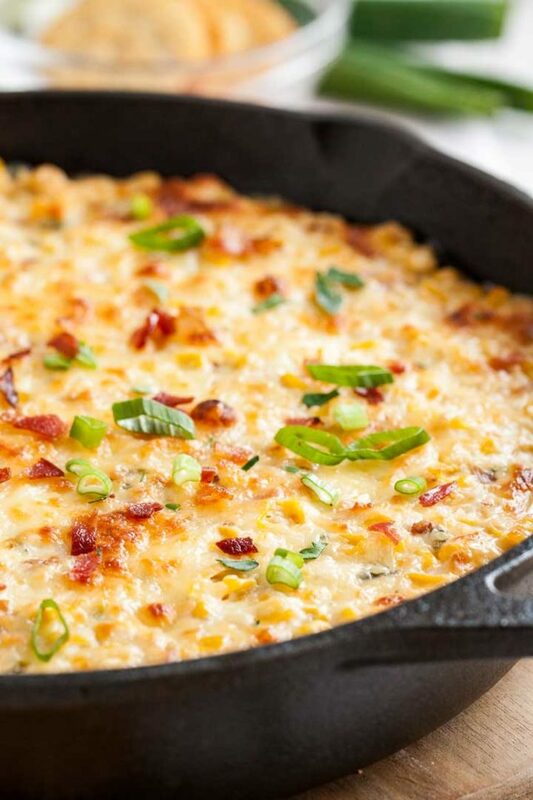 Want to try this Corn Dip Recipe? 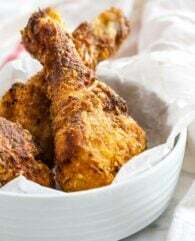 Preheat the oven to 350°F (175°C) and grease a 9-inch cast-iron skillet or similar sized casserole dish. In a large bowl, combine corn, mayonnaise, cream cheese, jalapenos, cheddar cheese, 1.5 cups mozzarella cheese, and parmesan cheese. Stir well until fully combined. Season mixture with salt and pepper. Add crumbled bacon and green onions. Stir until combined. Spread the mixture in the prepared skillet or casserole dish, sprinkle with remaining 1/2 cup of mozzarella and bake for 30 minutes until bubbly. Turn on broiler and bake for 1-2 more minutes until golden brown on top. Serve the dip warm from the oven with crackers or tortilla chips.